Anti-social behaviour has become a major political preoccupation of government and combating it is now a major plank of criminal justice policy. Yet anti-social behaviour as a concept has been little studied, and the notion has often been accepted uncritically. 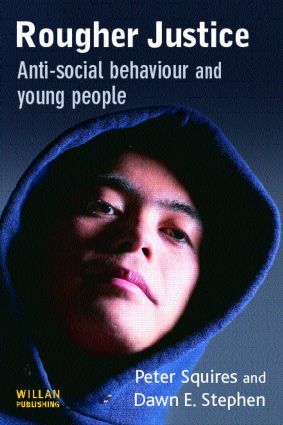 This book aims to meet this need, providing a critique of the government's use of the concept of anti-social behaviour and of youth justice strategy more generally. Rougher Justice foregrounds the perspectives and experiences of young people themselves. It draws upon recent developments within the field of cultural criminology to provide an alternative interpretation of the construction of 'youthful criminal careers'. It is underpinned by research in three separate areas which focus on the new youth justice, youthful criminal careers, and anti-social behaviour and acceptable behaviour enforcement. Central to the book is an ambition to understand youthful delinquency from the inside and to recover what is lost in much of New Labour's youth justice strategy --and the methods adopted by the Youth Justice Board to evaluate this strategy, that is to say a situated and interpretive understanding of youthful delinquency drawn from the perspective of and in the voices of young people themselves. The secret history of anti-social behaviour? Nipped in the Bud – youthful transitions or criminal careers?